The 2016 Federal Duck Stamp Print can be ordered through your local gallery or by contacting Plymouth Framery; You can call 763-550-0445 (Mon -Thurs) or email the friendly people at Plymouth Framery to reserve numbers, order prints, get quotes on framing and shipping costs. 2016 Federal Duck Stamp Prints will become available July, 2016. Remarqued prints will be available as artist completes original artwork. Plymouth Framery can also provide expert custom framing of your print. Dave and Colleen can help you with anything from the simple classic presentation to whatever bells and whistles you can imagine. 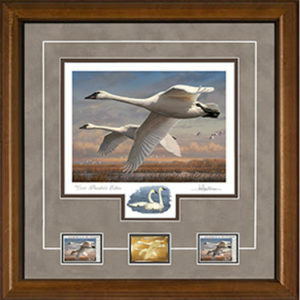 Call 763-550-0445 or email for quotes on framing and shipping costs. 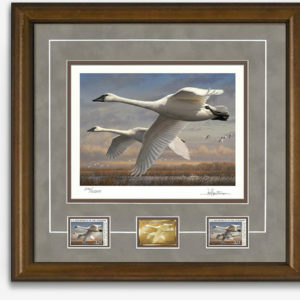 The 2016–2017 Federal Duck Stamp Contest winning design shows a pair of trumpeter swans flying over a peaceful wetlands scene. 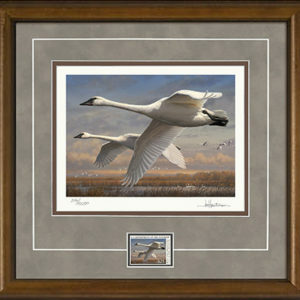 Having observed them closely in the field, artist Joe Hautman describes the trumpeter swan as a study in contrast: “Not only the black-on-white appearance, but also the contrast of their mostly silent flight, with the raucous trumpeting call, and the contrast of the lightness with which they seem to float as they are landing, with the power of the wing beats that lift them back into the air.” Although the trumpeter swan is no longer hunted, its appearance on the Federal Migratory Bird Hunting and Conservation Stamp highlights the importance of duck stamp dollars for all migratory species and the many other birds and animals that benefit from the conservation of habitat across America. 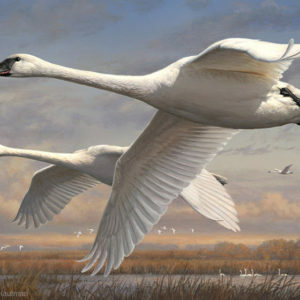 The trumpeter swan is the largest North American migratory waterfowl. They were once common in wetlands across a broad region of the country from Illinois northwest to Alaska, but the large, low flying birds were easily hunted and nesting habitat diminished as settlers moved across the country. 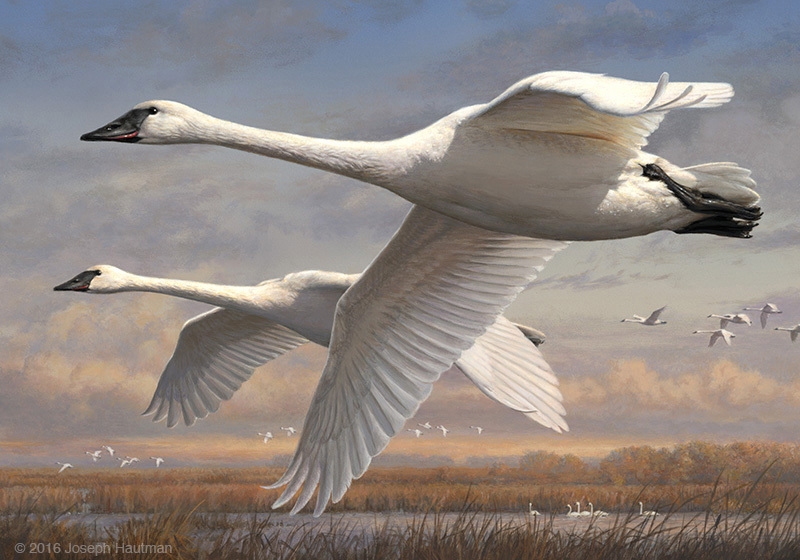 By the 1880’s, trumpeter swans had largely disappeared from the Mississippi flyway, and by the 1930’s, only 69 trumpeter swans remained in the lower 48 states. Recovery efforts in several states have successfully reintoduced the trumpeters to much of their former range. Today the estimated population of trumpeter swans in Minnesota alone is well over 10,000 birds. Extended hours offered by appointment.